Maxine Veronica Jacques, born in Las Animas, CO on October 7, 1960. Resided in Aurora, CO departed on February 1, 2019 at the age of 58 years old. 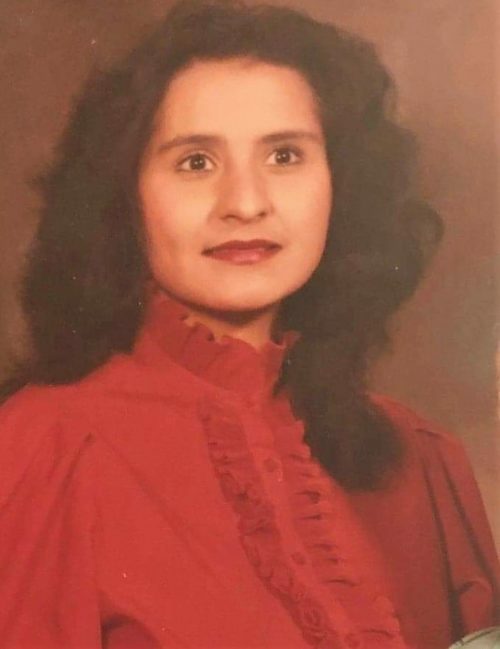 She's survived by her beloved mother, Veronica Cash; brothers, Eddie and Jerry Jacques; daughters, Vanessa, Priscilla, Melissa and Kassandra; 9 grandkids - 6 girls and 3 boys; two great grandkids - 1 girl and 1 boy; and three sons-in-law. Maxine enjoyed spending her time cooking, reading her bible and watching her Spanish soap operas. Most of all she loved spending quality time with her grandchildren. Her smile would brighten up everyone's day. Maxine was loved by all that knew her. She will be missed dearly. Funeral Services will be held at St. Therese Catholic Church 1243 Kingston St. Aurora, CO 80010 on February 15th 2019 at 10:00 a.m. Donation of flower arrangements or plants are greatly appreciated if anyone would like to donate. Cousin,Max I remember always you coming over to Mom’s house Auntie Pocha you and cousin Ray and you loved mom’s Bean’s . and you would always do our hair . Play dolls and make cakes on my easy bake oven . Then as we got order we started sharing clothes I will miss you and I love you so much..
My deepest condolences to the friends and family of Maxine. May your treasured memories bring you joy, and may ‘the God of all comfort’ give you strength, along with a measure of peace for your grieving hearts at this most difficult time.